Start spreading the news as we ring in 2019 in “Sinatra” style at Anthony’s Ristorante & Banquet Facility located just minutes from I-476 in the rear of The Drexeline Shopping Center, Drexel Hill, PA. This elegant facility offers a spacious ballroom, a large restaurant & bar area and unlimited free parking. Enjoy the tastes of Anthony’s award winning gourmet buffet along with a 5 hour premium open bar and reserved table seating options. 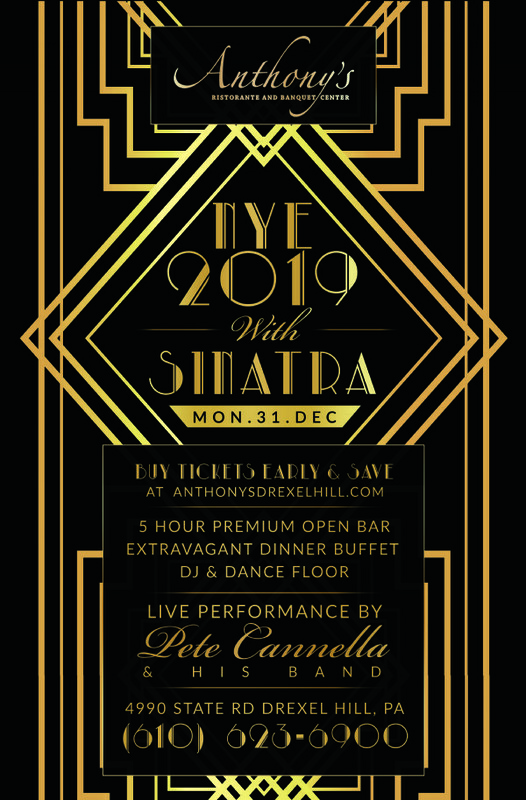 The area’s most captivating New Year’s Eve celebration is headlined by renowned front man Pete Cannella. Dance the night away to all the hits from good old “Blue Eyes” performed by Pete Cannella & his magnificent 8 Piece Horn Band. This interactive show is a modern take on Frank and other Rat Pack type performers and includes all the heart warming classics infused with current hits performed in that same authentic Sinatra style. Pete’s show is uniquely choreographed into an upbeat Vegas lounge style party which amazingly manages to entertain audiences who are both young and young at heart. His credentials include performances on several big stages, being the only amateur artist ever invited to play live on The Sid Mark “Sunday with Sinatra Show” and is widely recognized as the East Coast’s #1 Top Millenial Crooner. Best of all, Pete is a proud Delco Native and has his roots right here in Upper Darby PA. While Pete takes the party to 12AM, a DJ Joe Foley will spin sets before, during & after the show and DJ Jimmy Jam will be rocking the old school dance party upstairs in the main bar area so you can enjoy two great parties for the price of one. Other features for this event include very limited upgraded stage front seating options, party favors, free parking, balloon drop & champagne toast for the midnight celebration. If you are looking for a classy, hassle free and unique alternative for NYE this year, then this is the party for you. You must be 21+ years of age to attend and tickets are limited as this event will sell out. View More Events Organized by One Up Events. This event is organized by One Up Events.